When it comes to smartwatch, everybody wants one on their wrist. Therefore, we present you with some extraordinary smartwatches with exclusive offers. Here are the top 4 best selling cheapest smartwatches which are by far the best selling smartwatches in 2015. If you are still doubting to buy a smartwatch, read Why you need a smartwatch when you have a smartphone? When we talk about MIFONE W15 everyone knows about it. So we would directly shift to its specifications and see what it has to offer. It has got a 1.44-inch display with 2.5 D curved Sapphire glass protection. On the hardware side, it has 64MB RAM and 128MB ROM and it comes with Bluetooth v3.0. It has a battery of 405mAh which can last up to 208 hours. All these features and it just weighs 41 gram. It’s available in various colors to suit your needs. Its strap is made of TPSiV material of European grade and is also both comfortable and fashionable. 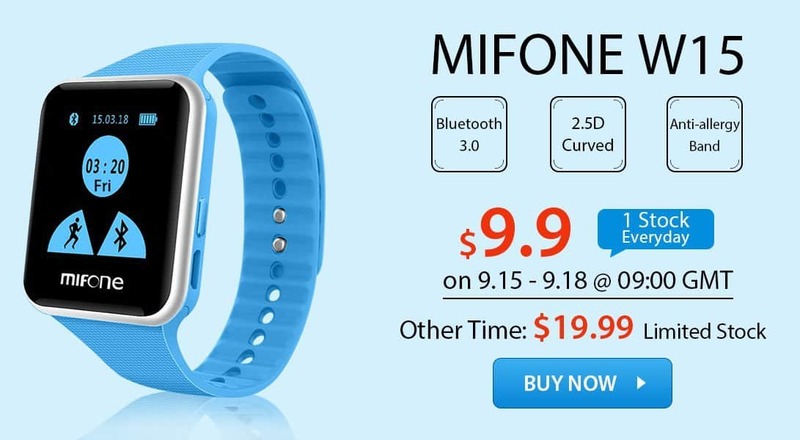 Also in this latest smartwatch you don’t need to install any app on your smartphone in order to use this, simply connect via Bluetooth and start using. Now coming to the offer: Every first buyer of the day will get it @ $9.9 whereas other time he/she will have to pay $19.99. The sale begins from 15th September @9:00 GMT every day but the stocks are limited so you need to hurry. 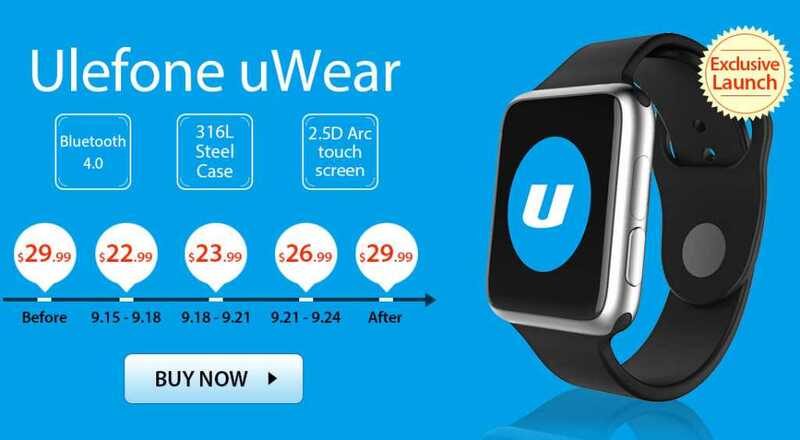 Ulefone uWear has fluoroelastomer sports strap as same as iWatch making it very much comfortable. Coming to display Ulefone uWear has a display of 1.44 inch with 2.5D arc touch screen. In the hardware section, it has got 32MB RAM and 32MB ROM and latest Bluetooth v4.0. It has a battery of 220mAh which will last up to 7days. • Pedometer / Sleep monitoring / Sedentary reminder. Unlike MIFONE W15, it requires an app to be installed on host smartphone. Stocks are very limited so grab it as soon as you can. Elegant appearance, powerful function, this is Zeblaze Crystal, the combination of beauty and “wisdom”. Zeblaze Crystal adopts Bi-color injection molding technology, uses 3D single curved tempered glass mirror and with the perfect radial design, let you experience the best skin touch feeling. 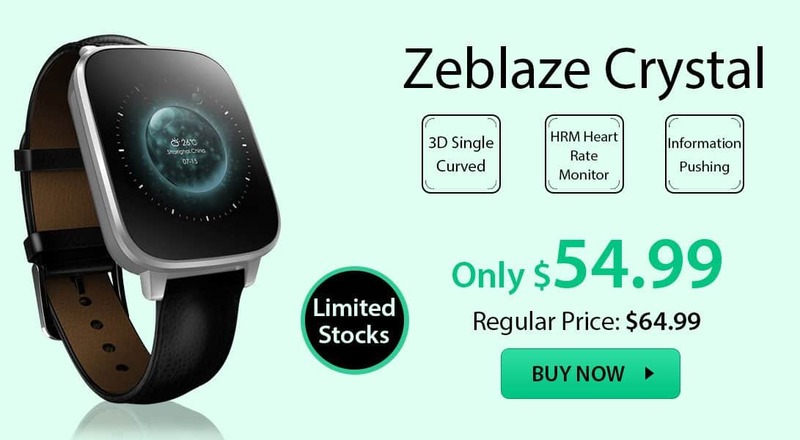 Coming to its specs, it has a screen size of 1.54 inch protected with 3D single curved tempered glass and in hardware section Zeblaze Crystal has got 128MB RAM and 64MB ROM. It also has latest Bluetooth v4.0 and certified IP65 waterproof. It is powered by 280 mAh battery which can last up to 72 hours. It’s available from 15th September @9:00 GMT at a discounted price of $54.99 and again stocks are very limited. 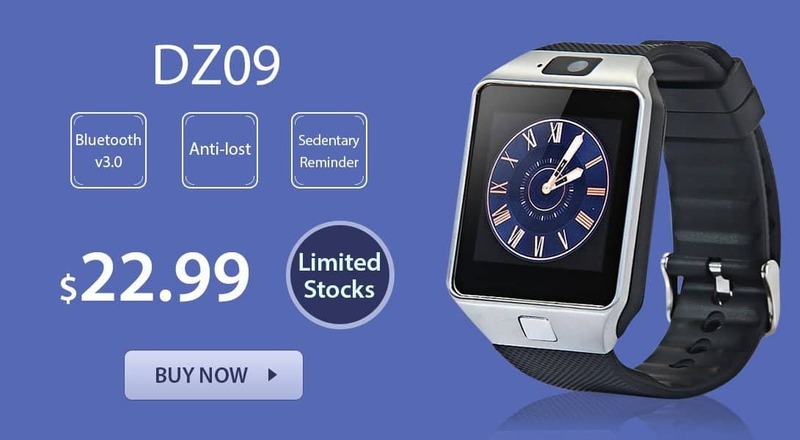 DZ09 Bluetooth Smartwatch is quite different from above-listed smartwatches. Apart from other features this one comes with a primary camera of 0.3 MP in case you need it. The rest of the specifications includes a screen size of 1.56 inch, 128M RAM,64M ROM and expandable storage up to 32GB via TF card. It has got Bluetooth v3.0 and is powered by a battery of 380 mAh which can last up to 180 Hours in standby mode.